Publications chair for the St. Augustine Genealogical Society. Marie Santry’s program is a case study of a man who grew up with the surname HASKELL. He had his father’s birth record, Social Security Application, and other documents identifying the Haskell surname. These records indicated he was born in 1892 in Lapeer County, Michigan; but searching census records did not find any such person in 1900 or 1910. He doesn’t surface in census records until 1920. Thus began a mystery that has led to two other surnames, more birth records, marriage records, newspaper accounts, court papers, and finally DNA tests. Marie has been researching her family history for almost 30 years and has helped others in their search as well. As a member of the Amelia Island Genealogical Society (AIGS), she designed an update on a genealogy course for beginners and has been a principle instructor in the course for 10 years. She has presented programs for AIGS, the Jacksonville Genealogical Society, the Coastal Georgia Genealogical Society, the Amelia Island Historical Society, and the Amelia Island Museum of History. She is past-president of AIGS, past –regent of the Amelia Island Chapter NSDAR, and a former vice-chairman of the Genealogical Records Committee of the Florida State Society DAR. She also serves the Florida State Genealogical Society, reviewing applications for their “Descendant of Florida Pioneers” Program. Join us on Saturday, February 16th, at the Southeast Branch Library located at 6670 US 1 South. St. Augustine Genealogical Society member meetings are open to the public at no charge. Check-in begins at 12:45pm and the meeting will be called to order at 1:00pm. We are kicking off the new year with a special treat. Miles Meyer is taking us on a tour of European archives. Europe is leading the way in putting many of their archives online. These archives provide an important resource for those researching their European ancestry. Miles will discuss how to find various regional and national archives and the steps needed to find those records that are most important to your research. The focus is on central European archives (France, Germany, etc.) and the larger archives such as the Europeana website. Miles is a scientist by training but has been active in genealogy for over fifteen years in a variety of ways. His expertise revolves around new technologies. He is a Family History consultant, lecturer and researcher. Additionally, Miles has been a beta tester for several genealogy companies including AncestralQuest, FamilySearch, MyHeritage, and BillionGraves, to name a few. Miles has produced several training manuals and maintains several websites and blogs on genealogy related activities. Join us on Saturday, January 19th, at the Southeast Branch Library located at 6670 US 1 South. 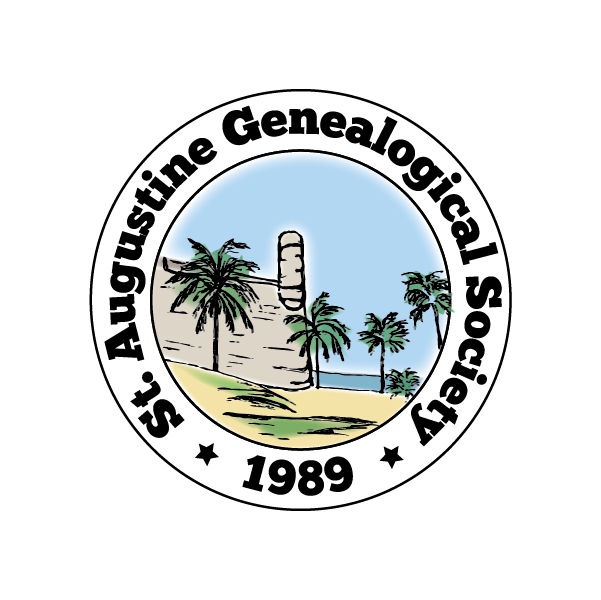 St. Augustine Genealogical Society member meetings are open to the public at no charge. Check-in begins at 12:45pm and the meeting will be called to order at 1:00pm. Paul Howes is our presenter and he will give us a look into The Howes One-Name Study. Join us on Saturday, November 17th, at the Southeast Branch Library located at 6670 US 1 South. St. Augustine Genealogical Society member meetings are open to the public at no charge. Check-in begins at 12:45pm and the meeting will be called to order at 1:00pm.